An international symposium showcasing the science and technology opportunities related to the Future Circular Collider (FCC) study is taking place at the Liverpool Arena and Convention Centre on Friday. The FCC study is an international scientific collaboration of more than 130 institutes, including the University of Liverpool, and led by CERN. It is developing design options for a potential higher performance particle collider to extend the research currently being conducted at the Large Hadron Collider, once it reaches the end of its lifespan. The FCC requires advances in many technology areas that can then also benefit other applications. Accelerators are used in many areas outside of fundamental research including proton beam cancer therapy, non-destructive testing and the development of new materials for the telecoms industry. The `Particle Colliders: Accelerators of Innovation’ symposium, organised by the University’s Department of Physics and CERN, will feature talks from leaders in the field of particle colliders , an industry exhibition, as well as hands-on activities for secondary school children to explain accelerator science. Dr Michael Benedikt, who is leading the FCC project at CERN, will deliver a keynote speech on the project. Other speakers include Dr Kate Shaw, from the University of Sussex who will speak about future particle physics experiments, and Professor Steve Myers OBE, former Director of Accelerators at CERN and now Executive Chair ADAM SA, who will give insight into the history and future of accelerators. The symposium sessions will be live streamed. Click on this link to watch,. The first session starts at 10.30am. Companies from across the UK and EU will showcase their latest products in an industry exhibition which will follow the morning talks. The exhibition will also serve Liverpool physics students as a careers fair where they can discuss employment opportunities in different sectors and find out where their degree might take them to next. In parallel, hands-on demonstrations engage participants in the technologies behind FCC. This will include CERN’s interactive LHC tunnel which comes for the first time to the UK. It also features Tactile Collider that was developed by experts from the Cockcroft Institute and Liverpool researchers to explain accelerator technology to visually impaired. The Symposium will be followed by an industry workshop in the afternoon. This will explore the FCC’s strategic R&D programme and the exciting opportunities this presents for industry involvement. Professor Carsten Welsch, Head of the University’s Department of Physics, said: “The University of Liverpool and CERN, together with partners from the FCC and EuroCirCol projects, are delighted to host this international event to showcase the science and technology challenges related to such a global project. 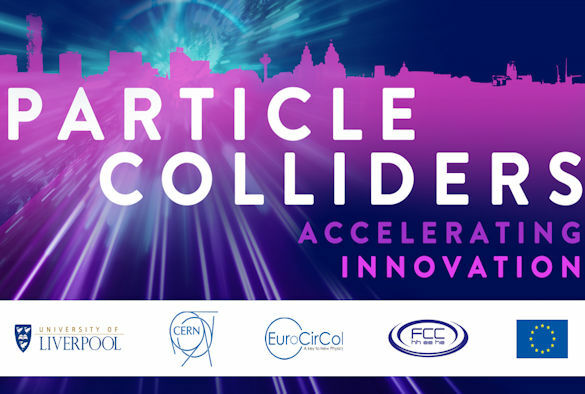 The Symposium on `Particle Colliders: Accelerators of Innovation` will take place on Friday, 22 March 2019 at the Liverpool Arena and Convention Centre. To follow the talks on the day or to find out more, please visit this webpage.